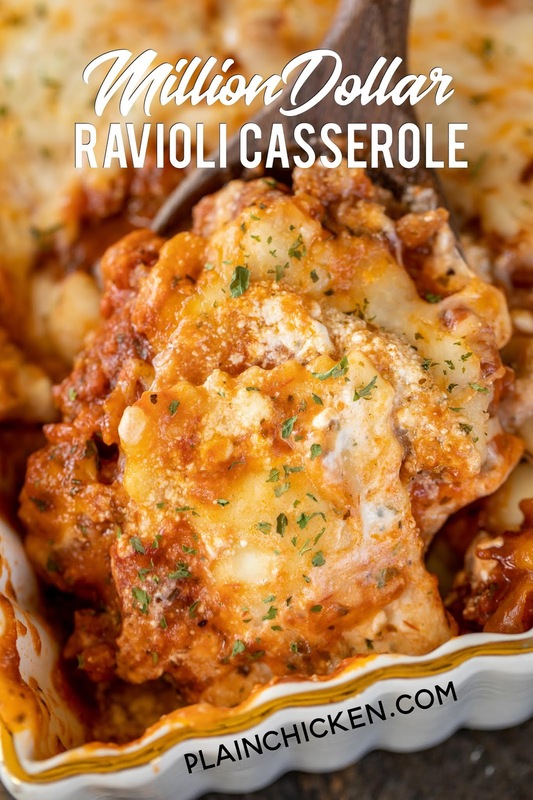 Million Dollar Ravioli Casserole - seriously delicious! Meat sauce, frozen ravioli, and 4 cheeses! The BEST pasta casserole EVER!!! Can make ahead and refrigerate or freeze for later. Frozen cheese ravioli, cream cheese, sour cream, cottage cheese, Italian sausage, spaghetti sauce, parmesan cheese, and mozzarella cheese. Serve with a simple salad and garlic bread. Great for dinner parties and potlucks! Everyone loves this easy casserole! I never have any leftovers!! 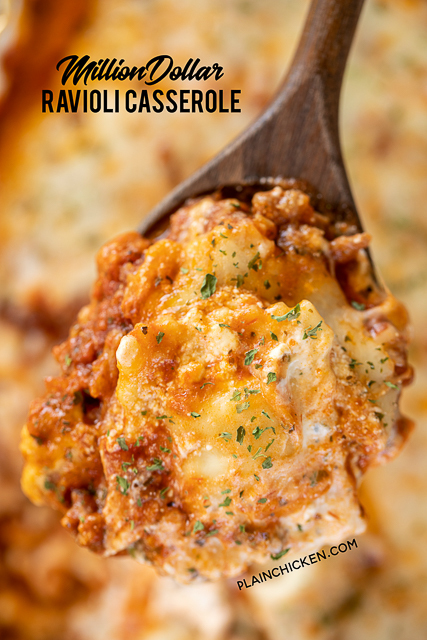 This Million Dollar Ravioli Casserole is a new favorite in our house! Meat sauce, ravioli, and tons of cheese. YUM! We ate this for lunch and dinner the same day. We just couldn't get enough of it!!! You can make this pasta casserole ahead of time and refrigerate or freeze for later. I like to make this and split it between two pans. Bake one now and freeze one for later. 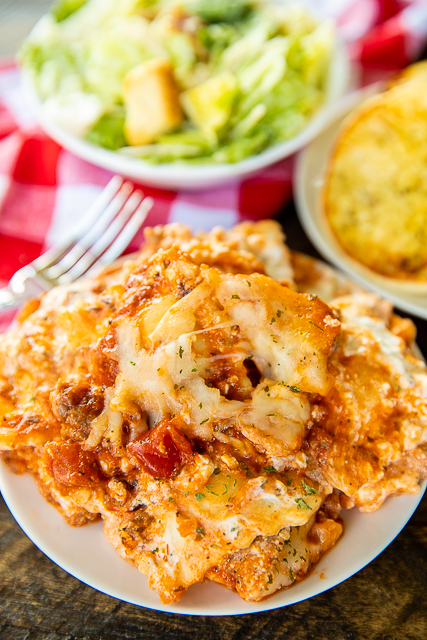 As I said, we LOVED this Million Dollar Ravioli Casserole! It is loaded with tons of amazing flavor. We served this with a salad and some garlic bread. If you need a good garlic bread recipe, check out our version of Carbone's Garlic Bread. I love it!! What is a good store-bought spaghetti sauce? I used a jar of Trader Joe's Roasted Garlic Marinara (green label) in this casserole. 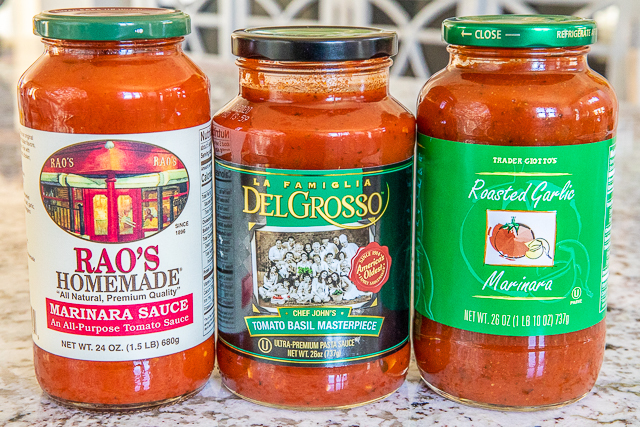 I also like Rao's or La Famiglia DelGrosso jarred sauces. All three of these jarred sauces taste great! I used Italian sausage for the meat sauce. If you don't like sausage, you can swap it out for ground beef or ground turkey. You might want to add a teaspoon of Italian seasoning to the beef or turkey to give it more flavor. Totally up to you. One last thing about the ingredients, I used a bag of frozen cheese ravioli. There is no need to thaw the ravioli first. It will cook in the casserole. Preheat oven to 350ºF. Spray a 9x13x2-inch pan with cooking spray. Set aside. In a large skillet brown Italian sausage. Drain fat from skillet. Stir in spaghetti sauce and set aside. In a large bowl, combine cottage cheese, softened cream cheese, sour cream, parmesan cheese, parsley and garlic powder. Add ravioli. Toss to coast. Spread ravioli in the bottom of the prepared baking pan. 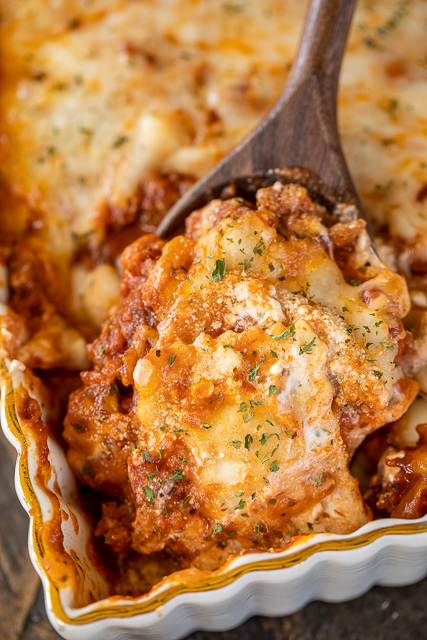 Pour meat sauce over ravioli and top with mozzarella cheese. 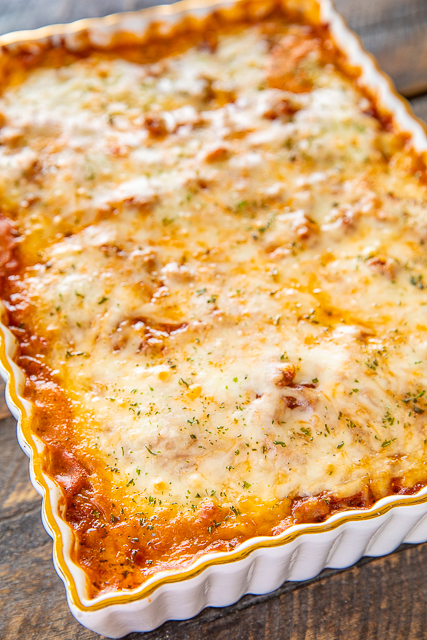 Love how easy this is - i'll never fuss with lasagna noodles again! Do you think you could make the night before, keep in fridge until next day & then bake? Will make this with my grandson! Do you think if I used ricotta instead of cottage cheese, it would still be one cup? I’ve never used cottage cheese in casseroles before but I’m going to branch out and give it a try. Do you prefer small curd or large curd? I am NOT a fan of cottage cheese (traumatic childhood experience) so I was skeptical. I made this recipe and used half the amount of cottage cheese that the recipe calls for and it was AMAZING! My husband and I both loved it! Can you use fresh ravioli instead of frozen? If so, how would you adjust the cook time? Hands down, this is the most delicious pasta casserole I've made. I followed the recipe exactly and divided it in half. I cooked one for dinner and froze the other. Both turned out just great! I'm making it again tonight and I'm going to try thawing the ravioli just a little bit beforehand as I found the frozen ones a bit difficult to work with. They kept sticking together and my hands were so cold after working with them. Hats off to Steph for a recipe that is now in my "favorites" file. Okay just made this and it is flipping delicious!! What size pans do you use when you split it into two pans, and should I change the cooking time if split into two pans? YAY! SO glad everyone enjoyed it. This is one of my favorites. I'm jealous you had the leftovers. I need to make it again soon!